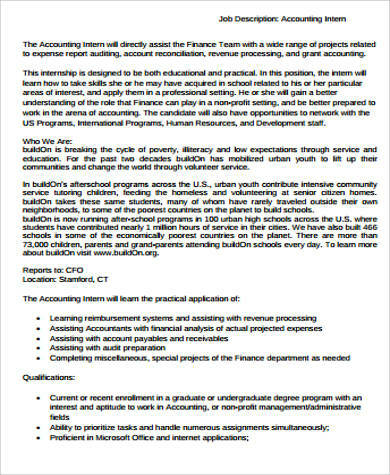 A single search for “accounting internships” generates so many openings and job vacancies. In 2014, statistics report that accounting services in the United States generated over 90 billion US dollars. The following year, its top four accounting firms Deloitte, Pricewaterhouse Coopers, Ernst & Young, and KPMG combined had employed about 818 thousand individuals, and there are over 138 thousand more firms in the United States alone. It is thus important for your accounting firm to stand out and to draw in the most competitive candidates. 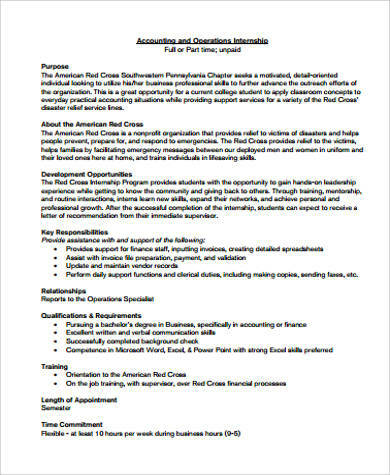 Compiled below are Job Description Samples to guide you in the creation and presentation of the most compelling internship opportunities. 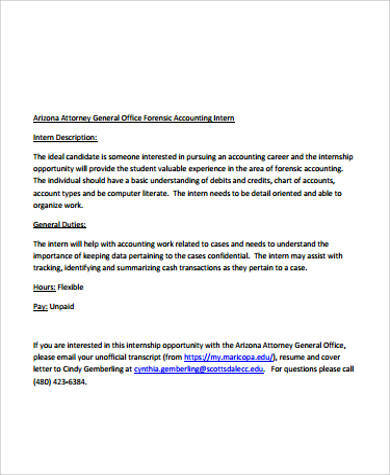 Offering internships to accounting undergraduates is a good way for any firm to potentially increase their pool of competitive and talented accounting affiliates. On the other end, taking on-the-job training at prominent accounting firms is a priceless starter for any undergraduate’s unfolding career in the industry. 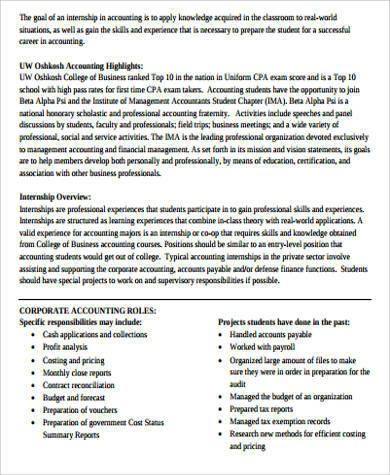 and forensic accounting, among others. 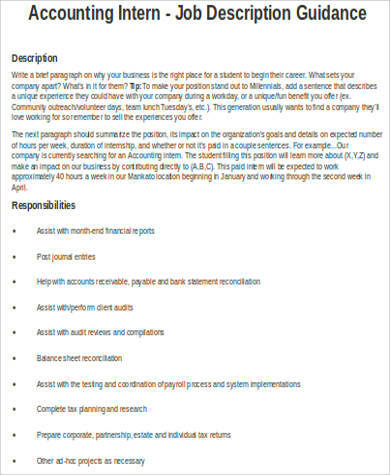 As shown in these samples, write on your job descriptions the branches that your accounting firm offers or specializes in. 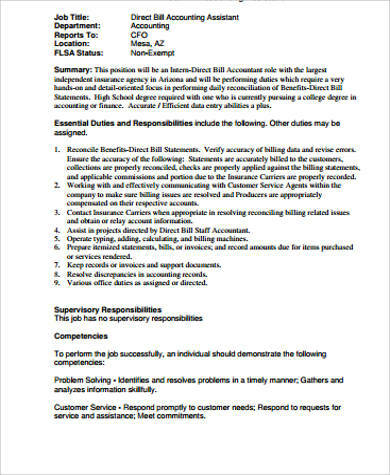 Use your firm’s official letterhead, and be sure to keep all the contents in your job description to two pages at the most. Take the samples on this post as your reference. The overview. 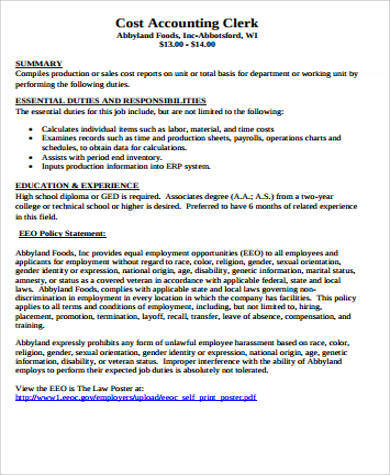 Provide for a general introduction on what kind of role interns will potentially play under your firm. The firm introduction. Give a background of your accounting firm: its current status, its line of work, and its achievement or awards, if any. This is not a section to copy and paste the actual unifying mission and vision statements of your firm. These are the mission statement and vision statements to your firm’s internship program; its objectives and aims, and what it hopes to achieve. 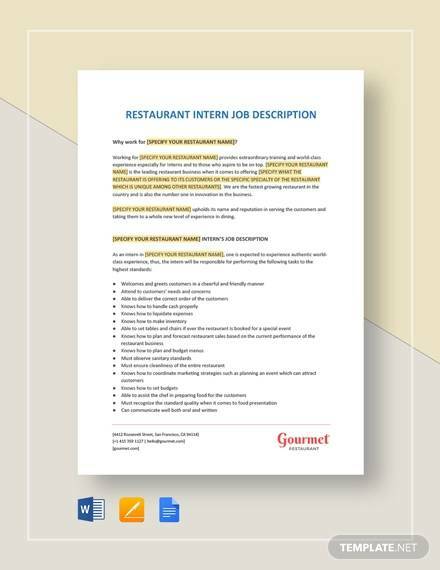 The duties of the intern.Enumerate and expound in detail all the duties and responsibilities that interns will take on. The qualifications for internship.This includes the minimum GPA or grade point average, along with other required skills and qualifications. The working period.Indicate how long the internship program will take and how many hours an intern will have to render for every working day. The salary.If any. Not all firms offer compensation for internship, although others do extend stipends, allowances, and reimbursements. other tasks assigned to them by their supervisors. 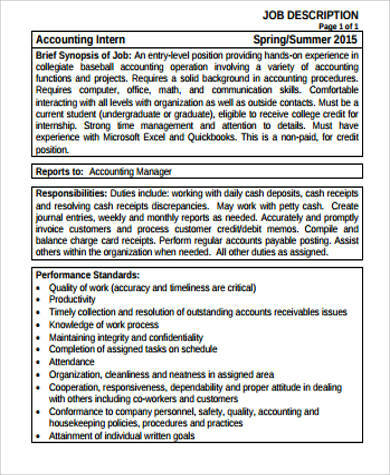 Quite simply, accounting interns are temporary employees at firms, rendering service for 12 months at the most, whereas accounting clerks are permanent, rank-and-file employees. Accounting clerks basically record, manage, and study accounting records. 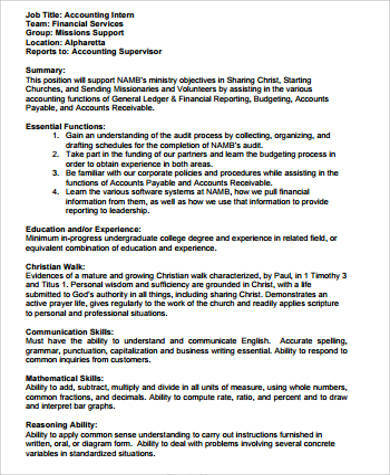 To expound on what their duties are, see these Accounting Clerk Job Description Samples.